While the Turnbull Government persists in spruiking "clean coal", renewables continue to be the quiet achievers in energy generation. Jade Manson reports. THE FUTURE of Australia’s energy generation has been a topic of impassioned debate in recent years. This has been spurred on by sharp reductions in the installation price of renewable energy. Solar and wind energy have now in many cases reached parity with installation prices for coal, and gas and is cheaper in the long-term. In December 2016, the World Economic Forum reported that solar and wind had the same installation price as fossil fuel companies in more than 30 countries. In 2016, clean energy investment grew by almost 50% in Australia. We have reached a tipping point, where investment in renewable energy will continue to rise, while investment in fossil fuels will fall. Lazard’s energy analysis shows that the levellised cost of energy for wind and solar now outperforms fossil fuel sources of power. Levellised cost represents every cost component – installation, operations and maintenance and fuel costs – divided by the total energy generated during the plant’s lifetime. Discussions comparing renewable and fossil fuel electricity generation usually centre around the up-front costs and do not consider the generation costs, or the social and environmental consequences of different energy sources. Renewable energy has significantly lower generation costs and does not require continued fuel supply. With installation costs now being similar – and likely to decrease significantly over the next decade – renewable energy is a tremendously worthwhile investment that will break even rapidly and continue to provide returns indefinitely. This economic competition is making fossil fuel companies nervous and contributing to the heated debate around the issue. Fossil fuel companies still hold a significant amount of power and influence after decades of being at the top of the economic food-chain. Companies such as China National Petroleum, Sinopec Group, Shell Global and ExxonMobil are all in the top ten largest businesses globally, with over $100 billion in annual revenue. These companies are using the wealth they have accumulated since the beginning of the industrial revolution to influence politics and the global market toward their own interests. This can be seen clearly in the fact that, despite the economic, health and social benefits of renewable energy, those in Parliament continue to support fossil fuel companies. The Turnbull Government plans to provide coal-giant Adani $1 billion of tax-payer dollars to build a coal mine and rail in the Galilee Basin off the coast of the Great Barrier Reef. There has been an extended campaign against the mine by citizens and environmental groups and whether the mini will go ahead is currently uncertain. Meanwhile, over 50% of corals in the Great Barrier Reef are estimated to have died and 90% have been bleached over the past two summers. The reef provides Australia with $6.4 billion in tourism revenue annually. The government continues to subsidise fossil fuels significantly more than renewable energy. The 2016 Federal Budget included 7.7 billion in fossil fuel subsidies. Meanwhile, the Coalition Government axed over $1 billion of funding to the Australian Renewable Energy Agency and shut down the Australian Climate Commission. Australia''s greenhouse gas emissions increased in 2016 compared to the previous year, making us the only advanced economy that continues to see an increase in emissions. A poll in 2016 found that ending fossil fuel subsidies was Australians’ preferred revenue raising measure, with 58.9% of respondents agreeing the government spends too much on fossil fuel subsidies. Australians are increasingly aware that the benefits of renewable energy to society are immeasurable. The energy that we use daily brings huge profits to the major electricity retailers, as well as mining companies, electricity suppliers and electricity distribution companies. Without the influence of these companies in politics, our political system will have a chance to be more democratic. In 2014, the Liberal Party received an estimated $1.8 million in donations from energy companies. Without these donations, the political and economic landscape will change. As we move towards a greater percentage of renewable energy generation, electricity prices will decrease dramatically for everyone, decreasing levels of poverty. Electricity prices makeup 30-40% of the average power bill In South Australia according to the South Australian Council of Social Services and are a large portion of the budget for any home or small business. If everyone can access electricity cheaply, those with lower incomes or people starting small businesses will be on a more even playing field. Transport, which is often more expensive for the poorest people who live in the outer suburbs, will also be cheaper. Increasing renewable energy investment will also create more jobs and will allow Australians to capitalise on the renewable energy investment boom. While the Coalition declares "coal is good for humanity", solar jobs are rising and in 2016, made up 665 of open energy job postings. According to Solar Citizens, renewable jobs increased by 34% in the first quarter of 2016. Indeed, data showed that solar positions made up 66% of open energy job postings, against oil with a 21% share and coal with 10%. South Australia has sped past its renewable energy target of 50% renewable generation eight years in advance, putting it on track to reach 100% renewable generation by 2030. This should be achieved more easily than in the previous 15 years due to the falling cost of renewable energy. 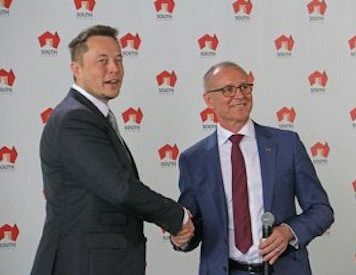 A deal has recently been made between the South Australian Government and Tesla CEO, Elon Musk, to install the world’s largest battery in South Australia. The battery is to be installed in 100 days or it will be free, which could lose Musk around $50 million. This follows recent controversy over a lack of backup generation for the South Australian electricity grid, which has been attributed to many factors, including the varying nature of electricity generation from solar and wind energy. The power networks have been accused of load shedding during times of high demand, causing blackouts. There have also been reports that power generation companies have found it more profitable at times to limit supply, in order to increase the price of electricity. A state-wide blackout during a storm in 2016 was blamed on wind turbines when it was actually due to extreme weather events. Electricity prices in South Australia have remained high and even increased over the past decade. Last year, SA Energy Minister Tom Koutsantonis challenged South Australian Power Networks (SAPN) increased electricity prices, which he termed an “unnecessary price hike'', at the Australian Competition Tribunal. Electricity prices in South Australia are very high compared to the Eastern States. The Eastern States are part of a highly interconnected grid, while South Australia only connects to Victoria via two locations. Typically 90% of energy prices in South Australia come down to generation (45%) and distribution (45%). The generation component is made up of several power sources, including gas, diesel and renewable energy sources. These suppliers bid into the market, and the lowest bids are accepted by the Australian Energy Market Operator (AEMO) until demand is reached. When renewable energy is in the mix, the market price for generation is very low. The distribution component is a duopoly run by the companies ElectraNet (owned by State Grid Corporation of China, YTL Corporation Malaysia and Hastings Funds Management) and SAPN (owned by Cheung Kong Infrastructure Holdings Hong Kong). This international ownership of South Australia’s electricity grid has raised security concerns, as these companies may not act in South Australia’s best interests. A bid by Cheung Kong Infrastructure Holdings to buy the NSW electricity grid was knocked back in 2016, on national security grounds. Due to lack of competition, there is the potential for unnecessary price increases by the power distribution companies. As renewable energy becomes more prevalent, power distribution will make up a larger share of energy costs and these problems will need to be addressed. Renewable energy infrastructure should lead to reduced electricity prices, due to their significantly decreased running costs. If this is not the case, then it calls into question the pricing by the power suppliers and distribution companies. If pricing becomes disproportionate to the service provided, then the government may need to introduce increased regulation or buy back the grid from private distribution companies. You can follow Jade Manson on Twitter @JadeAlanaM.